Having had the privilege to listen to many CDs and write reviews of them for our BSCP newsletter, I have only on a few occasions been approached by weekly attending BSCP Thursday jammers with a completed project that they would like me to give a listen to. 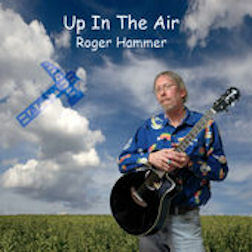 Our long, tall, blonde hair bassist, Roger Hammer, has just released his newest of three CDs, all of which are available on iTunes to sample and purchase. "Up In The Air" is the title of this one. A bit of background about Roger that I learned recently by sitting and chatting before the jam is that he was born and raised in Nebraska. As a youth, Roger began his music education on clarinet. 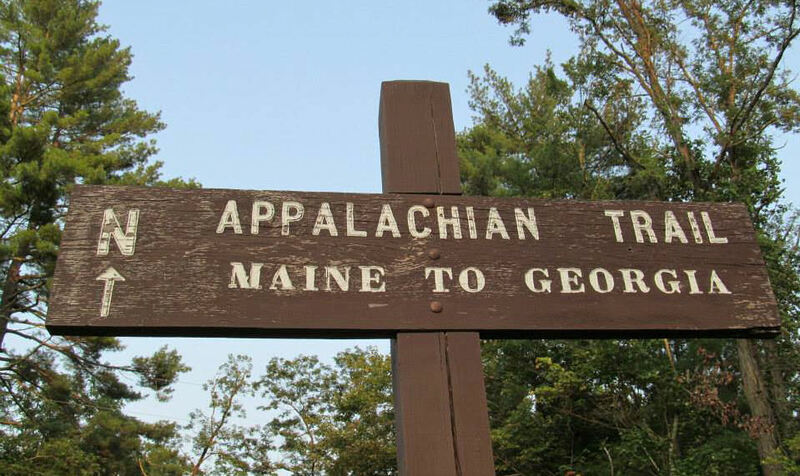 Afterwards he began hearing and learning about American blues music from the British invasion bands of the mid-sixties....the same way many of us became aquainted to it due to American media's shunning of it. At around 16 years old, Roger began to "hold down the bottom" by picking up and learning bass guitar. After leaving the heartland of this country, Nebraska, Roger lived and worked in Chicago. Now there's a place where a fellow can learn a thing or two about blues music! Several years ago Roger's career brought him east into the Harrisburg area where he learned of our BSCP Thursday jam from a local music store. He rarely misses a week, so sit down and introduce yourself to him and share some stories. With 13 tracks of original songs, "Up In The Air" includes tunes that were written by life situations that were inspirational to Roger. 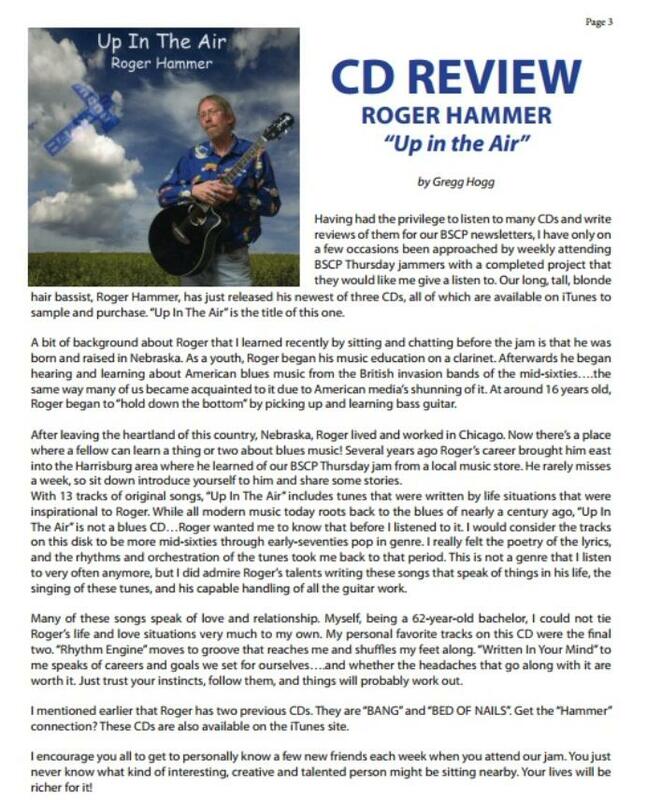 While all modern music today roots back to the blues of a century ago, "Up In The Air" is not a blues CD....Roger wanted me to know that before I listened to it. I would consider the tracks on this disk to be more mid-sixties through early-seventies pop in genre. I really felt the poetry of the lyrics, and the rhythms and orchestration of the tunes took me back to that period. This is not a genre that I listen to very often anymore, but I did admire Roger's talents writing these songs that speak of things in his life, the singing of these tunes, and his capable handling of all the guitar work. Many of these songs speak of love and relationship. Myself, being a 62-year-old bachelor, I could not tie Roger's life and love situations very much to my own. My personal favorite tracks on this CD were the final two. "Rhythm Engine" moves to groove that reaches me and shuffles my feet along. "Written In Your Mind" to me speaks of careers and goals we set for ourselves....and whether the headaches that go along with it are worth it. Just trust your instincts, follow them, and things will probably work out. I mentioned earlier that Roger has two previous CDs. 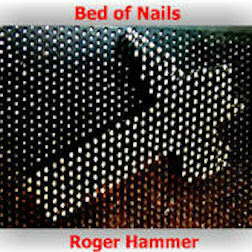 They are "Bang" and "Bed Of Nails". 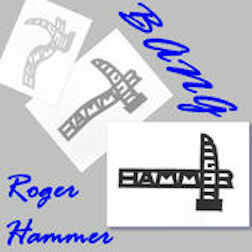 Get the "Hammer" connection? These CDs are also available on the iTunes site. I encourage you all to get to personally know a few new friends each week when you attend our jam. You just never know what kind of interesting, creative and talented person might be sitting nearby. Your lives will be richer for it!